Thinking about serving ham or pork for Thanksgiving dinner? 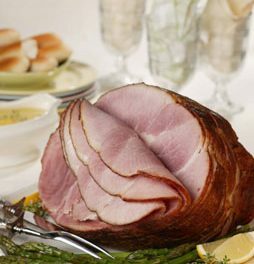 Take a look at this collection of recipes that include ham or pork. All recipes include nutritional information to make your Thanksgiving day meal planning for diabetes easy. Mediterranean flavors and fall harvest vegetables complement this succulent pork roast. This tasty dish is a cinch to prepare and is sure to satisfy any appetite. Younger kids can help by setting the table and older kids can wash and chop your family's favorite veggies. Recipe for Harvest Pork Roast with Vegetables from our Main Dishes recipe section. Recipe for Coriander and Cumin Roasted Rack of Pork with Five Spice Pumpkin Puree and a Chile, Pumpkin Seed and Cilantro Salad from our Main Dishes recipe section. Simply elegant: Pork roast wearing a mustard-and-crunchy crumb coating. Serve with steamed broccoli spears and a green salad. Recipe for Mustard-Crusted Pork Roast from our Main Dishes recipe section. Recipe for Boneless Pork Loin Roast with Herbed Pepper Rub from our recipe section. Recipe for Apple and Cornbread-Stuffed Pork Loin with Roasted Apple Gravy from our Main Dishes recipe section. For a delicious alternative to the pears, substitute for a tart green apple, such as Granny Smith. Instead of rosemary alone, you could combine it with sage and thyme, for a slightly more complex flavor. Green vegetables should be simple and along the lines of sauteed green beans with toasted almonds, or steamed and sauteed Brussels sprouts with hazelnuts. Recipe for Pork Roast with Sweet Potatoes, Pears and Rosemary from our Main Dishes recipe section. The trio of ginger-nutmeg-cinnamon will remind you of pumpkin pie. The spices and apples create a classic flavor that marries well with pork. Serve with baked sweet potatoes and roasted Brussel sprouts. Recipe for Roasted Pork Loin with Apples and Cinnamon from our Main Dishes recipe section. Mediterranean flavors and fall harvest vegetables complement this succulent pork roast. This tasty dish is a cinch to prepare and is sure to satisfy any appetite. Younger kids can help by setting the table and older kids can wash and chop your family’s favorite veggies. Recipe for Harvest Pork Roast with Vegetables from our Main Dishes recipe section. This roast is simple enough for a Sunday supper with the family or elegant enough for entertaining. In either instance it is a snap to prepare. Dried fruit (pick seasonal favorites) create a colorful and immensely flavorful channel down the center of the roast. The mustard coating seals in the moisture creating a delicious crust. Arrange overlapping slices of the roast on a platter and serve with steamed new potatoes or mashed sweet potatoes and a seasonal vegetable. Recipe for Fruit-Stuffed Pork Loin with Dijon-Garlic Crust from our Main Course recipe section. Recipe for Herb-Roasted Pork Tenderloin from our Main Courses recipe section.